It's been raining in Seattle the past two days, and the kids are getting stir-crazy. I think it's time for a little Rainy Day Playdough. Make the mix and put it in a sealable sandwich bag. Sew a simple drawstring bag, drop in the mix, and cinch it with coordinating ribbon. Print out the directions and attach by punching a hole and threading the ribbon through it. Makes a great gift! Place Rain Day Playdough mix in a saucepan. Pour ingredients into saucepan with mix and cook over medium heat, stirring constantly. The dough will look like a "big mistake" at first, but keep going. The heat and stirring will solidify the mixture and the dough will soon begin to make a big ball and stick together. Turn off the stove and remove pan from heat. Place dough on the counter and knead a few minutes until it's done. Have fun! Canning season is ramping up, and here in Washington we're picking our own berries, putting in orders for boxes of peaches, and looking for fun gift ideas to compliment the bottles of goodies we'll soon have coming out our ears. Stacy has already made several batches of raspberry jam and syrup, and she's the only one in her house who will eat them! I am a canning-idiot, but I'm learning. Every year my grandma stocks my food storage shelves with canned pears, peaches, pickles, raspberries, green beans, chili sauce, and tons of jam in every flavor. This year I've felt a sense of urgency to learn this art before she's gone and I can't get those peaches anymore! Whether you're new to home food preservation or an expert canner, this book, The Ball Complete Book of Home Preserving, is a must-have. It has simple instructions as well as troubleshooting tips, and it answers every question you have (and some you didn't even know you had!). Canning is both an art and a science, and this book instructs on both ends of the spectrum. There are 400 recipes to try, like Mango-Raspberry Jam, Green Pepper Jelly, Pickled Asparagus (so yummy in salads), and Tomatillo Salsa. Stacy made a batch of the Orange-Raspberry Syrup which I drowned a batch of Swedish pancakes in the other night. De-lish. A bottle of homemade jam makes a great gift. Especially to friends who don't dabble in home food preservation themselves. A few of Stacy's lucky neighbors got a jar with a loaf of homemade bread the other day. 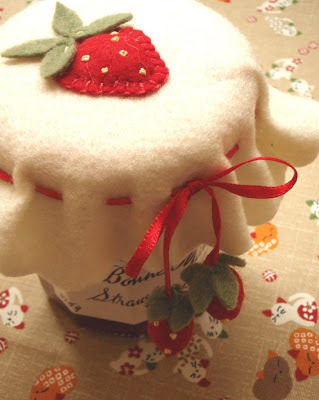 Of course the jam itself is a pretty little gift, but to make it even cuter we found these fun felt jam toppers from lucykatecrafts.blogspot.com with a great tutorial (look at the adorable strawberries hanging from the topper!) and these easy, FREE, printable vintage labels from hp.com (there's a great selection to choose from). Now if those don't make your bottled creations palatable, nothing will. P.S. We are not recipe snobs here at Little Birdie Secrets. If you want the recipes for the homemade bread or Swedish pancakes, just leave us a comment! 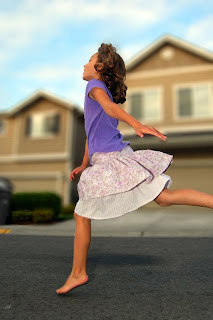 This super simple layered skirt was made by Stacy from a tutorial on Tammy Whelan's Grand Revival Design blog. She is a fabric and pattern designer and she is incredible. I am in love with her Ava Rose collection. Makes me want little girls! 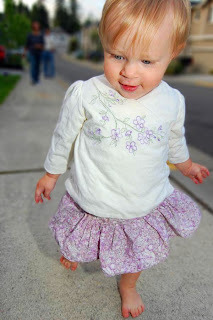 She has photos of skirts made from her tutorial using her fabric lines and they are all fresh, funky, and adorable. Perfect for summer! 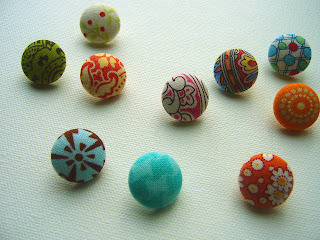 Plus she has lots of other great patterns and ideas. Check it out! My kids are constantly creating art (mostly monsters at the moment), and I'm running out of real estate on my refrigerator. So this kids art board was a perfect solution. Cut and rout a piece of plywood to whatever size you like. Sand then paint or stain (I painted black over red paint, then sanded so the red showed through, and stained any bare wood showing under that). Then glue large magnetic clips (we found these at Staples in a package of three) evenly across the board. Attach hardware to the back to hang it on the wall and you're done! I hung mine at the kids' eye level so they could hang the art themselves. If you have a Cricut or other vinyl cutting machine, try using a larger board and cutting words for your board like "Adam's Artwork" or "Look What I Made!" My boys went crazy over this board and changed the pictures a hundred times once it was hung. My four-year-old even told me we needed "about 100 more clips" so he could hang ALL his artwork. I guess it's a hit! 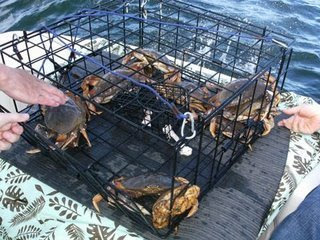 Here in the Pacific Northwest, crabbing is a favorite (and delicious) pasttime. Stacy's parents go out almost every weekend during crabbing season, and they are always willing to share their delectable catches. 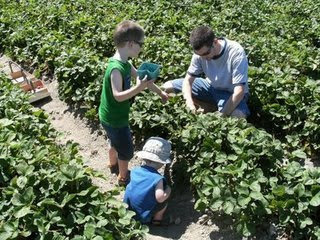 Recently Jessica's husband went out with them and helped bring in a great haul (see above). So what do you do with all that crab meat? Sure, you can never get tired of sweet, succulent, crab legs, but there are so many other ways to enjoy a crab. This great cookbook, I Love Crabcakes! 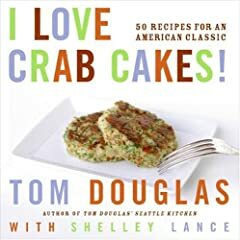 by Tom Douglas, features 50 recipes for amazing crab cakes, whether you hail from the North, South, East, or West. We cooked up a few batches, but unfortunately, they were all eaten before we could get them on camera! Our favorites were Steven's Perfect Dungeness Crabcake with Tomato Avocado Salsa and Coconut Crusted Crab Cakes. Yum! If you want to try them, you'll just have to get your hands on a copy of this book and make a few yourself. And by the way, you don't have to live on the coast to enjoy homemade crab cakes. Costco sells canned crab meat that is perfect for all of these recipes. And it's much easier to extract it from a can than from the actual shellfish! So you have no excuse. Get cookin'! . . .a BIG secret. Three friends, Stacy, Mandy, and Jessica, decided to create a crafting/cooking/tip blog to share all the fun ideas and projects they were finding while feeding their hobby addictions. And you've found it! Welcome to our new blog. Little Birdie Secrets is a place for us to post projects we've made or seen in books and on the internet (plus some step-by-step tutorials), recipes and cooking tips, crafts to do with your kids, money-saving ideas, and other fun things we've come across. We don't think these should be kept secret, so we're going to share them with you! A little about the three little birdies: We live in the Seattle, WA area and have to find lots of fun things to do indoors while the weather is crummy nine months out of the year. So we love to make things with our kids, try out new projects, share recipes, bargain shop, and be the most creative women we can be. Mandy loves papercrafting, scrapbooking, sewing, and quilting, plus lots of other things she doesn't have time to do with two silly boys under her feet pretending to be dinosaurs or fire-breathing dragons. 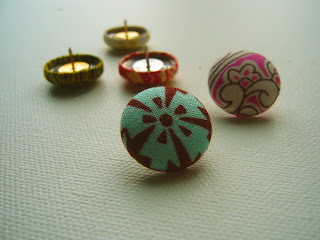 Stacy is a craft-aholic and can make anything she tries (she says she'll try anything once! ), even with three busy kids (four if you count her husband). She has the greatest stash of EVERYTHING, including fabric, art supplies, adhesives, and notions. She exudes creativity. Jessica says she doesn't have a crafty bone in her body, but she has a great sense of style and is exceptionally talented in the kitchen. Plus she has two sweet little taste-testers that keep her on her toes. She boasts a huge recipe collection and tons of great tips for everything from freezer dinners to homemade jam. Believe me, the girl knows good food. So that's us. Thank you for taking the time to visit our nest. We plan to give you something creative every day and hope you'll keep us on your list of must-read blogs. Watch for prizes and giveaways, and if you'd rather buy than try a project, check out our Etsy stores soon for some of the "extras" we make while trying new things. And if your friends want to know where all these creative ideas are coming from, tell them a little birdie told you about littlebirdiesecrets.blogspot.com!